Membership in the Peninsula Golf & Country Club is open to, and mandatory for all Peninsula purchasers. A membership will include the primary member, their spouse or domestic partner, and children up to the age of 23. The club also makes access available to other family members and guests*. There are three different membership levels – Reserve, Sport, and Social – available, each providing a different level of access to club amenities at a different cost level. There is an initiation fee or membership deposit to be paid upon joining the club – this a one-time expense. Thereafter, you pay dues on a monthly basis. There is a $750 per year food minimum purchase, with all food charged to your club account counted toward meeting that requirement. 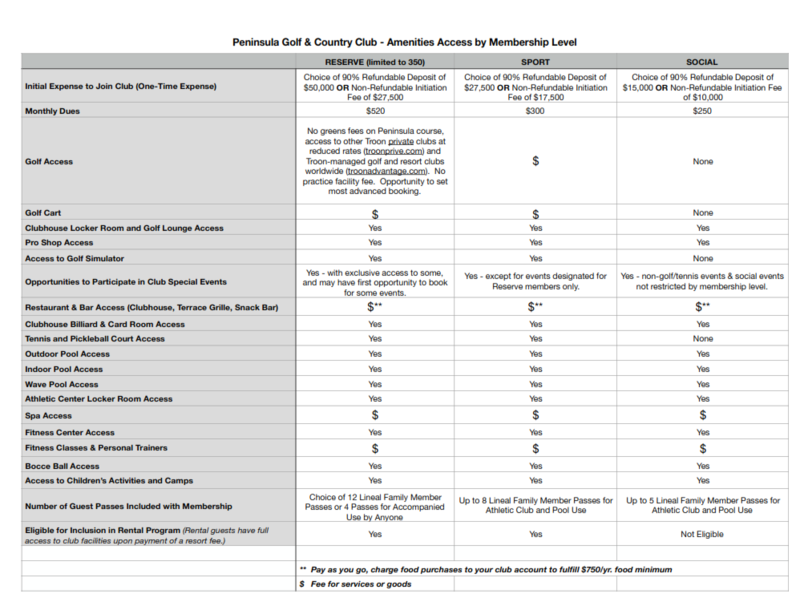 The chart below gives you an outline of the facilities, services, access levels, and costs at each level of membership. Ask the club membership coordinator your specific access questions.